Vinai Thummalapally is the Executive Director of SelectUSA. Graph showing the growth in Brazilian assets in the United States, from $29.2 billion in 2007 to $93.6 billion in 2012. Source: Brazil-US Investments Map by Apex-Brasil. With Brazil President Dilma Rousseff visiting the United States this week, the U.S.-Brazil relationship is front and center on the national stage. Last week, I spoke at the launch of the Brazil-U.S. Investments Map [PDF], a new report highlighting Brazilian foreign direct investment in the United States. The report was produced by the Brazilian Trade and Investment Promotion Agency (Apex-Brasil), the Brazil Industries Coalition, and the National Confederation of Industry of Brazil. 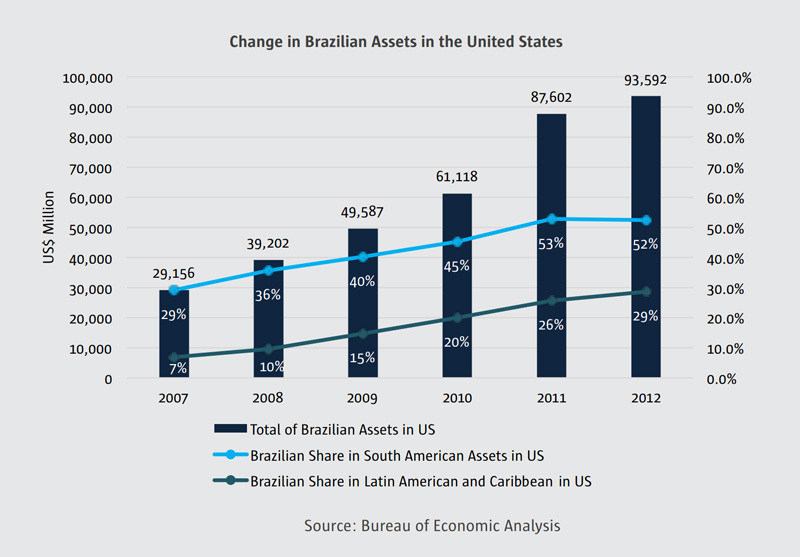 According to the report, the value of Brazilian majority-owned total assets in the United States grew by 221 percent between 2007 and 2012 to $93.6 billion (see graph). The value of U.S. majority-owned total assets in Brazil has also grown during the same period to $283 billion, and represents 53 percent of all U.S. majority-owned assets in South America. This growth in bilateral investment supports many jobs for U.S. and Brazilian workers. As of 2012, U.S. subsidiaries of Brazilian firms employ more than 76,100 workers in the United States according to the Bureau of Economic Analysis. During the launch event’s panel discussion , I enjoyed hearing from Antonio Moreira, CEO of North American operations for the global IT company Stefanini. Headquartered in Sao Paulo, Stefanini has invested in seven U.S. states during the last 15 years and employs more than 2,000 associates in the United States. According to Moreira, the key to Stefanini’s success has been preserving the company’s culture and values while respecting each community’s local culture and way of doing business. 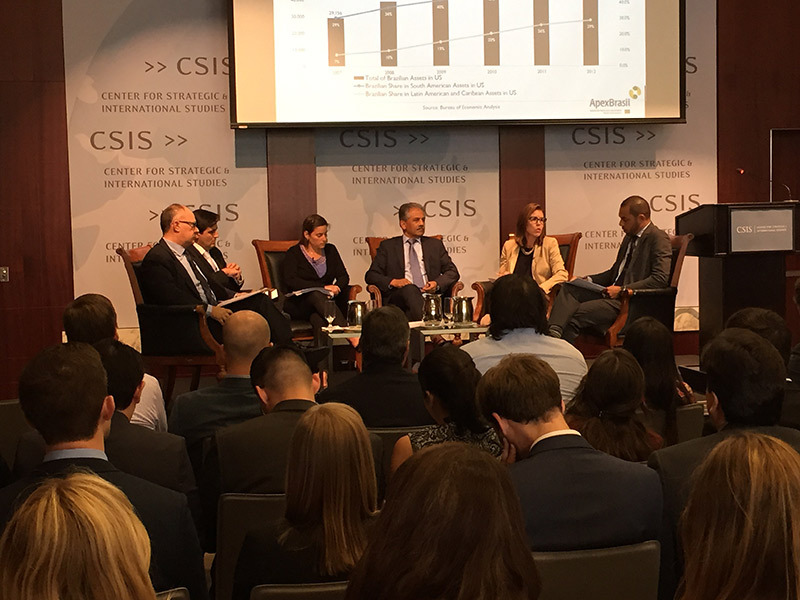 SelectUSA Executive Director Vinai Thummalapally (third from right) participates in a panel discussion hosted by CSIS Americas for the launch of a new report on U.S-Brazil bilateral investment flows. Knowledge-intensive industries such as IT services are critical to U.S.-Brazil bilateral investment—the aerospace sector is another great example. Brazil-based Embraer, the world’s third-largest aircraft manufacturer, has facilities in four U.S. states and a large number of local parts and equipment suppliers in the United States. This highly innovative sector represents a tremendous opportunity for investors, and I hope to see a strong delegation of Brazilian companies at the National Aerospace FDI Exposition in Los Angeles, on October 26-28, 2015. Across all industries, the U.S. Commercial Service is working closely with local associations in Brazil through the SelectUSA program to support cross-border projects by Brazilian companies looking to start or expand operations in the U.S. market. Here at home, our team of investment experts can help U.S. states, cities, and regions attract Brazilian investors to their communities. Both international companies and U.S. economic development organizations (EDOs) can take advantage of SelectUSA’s free services to get market-specific information and counseling. I invite all U.S. EDOs to consider signing up for our SelectUSA Road Show to Brazil on December 1-4, 2015, where they will meet directly with investors in three cities. Stay tuned for a webinar in mid-July with more details, and you can contact Investment Specialist Andre Leal with any questions in the meantime. The future is bright for the U.S.-Brazil economic relationship, and I look forward to welcoming many more Brazilian companies to our communities in the years to come.